The Nautic SUP Crossing is one of the largest European races which gather some of the most determined SUP riders ever. This year, the event, which was held in conjunction with the international boat show, Salon Nautique de Paris, brought together more than 200 competitors, who showcased their skills in nearly freezing temperatures. The riders competed in two events on Saturday: a distance race on the River Seine and indoor sprint races at the boat show. 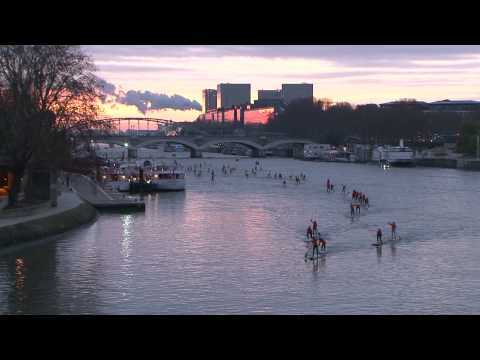 The main event of the Nautic SUP Crossing was the scenic tour of Paris, when the competitors paddled 12km down the Seine, passing the Eiffel Tower and other famous Parisian sites. At the end of the event, after combining points from the distance and sprint races, windsurfing Olympian Faustine Merret and Eric Terrien from France claimed the overall winner titles. You can check out some cool footage from the event in the related videos section below. Enjoy!